Successfully Added Outdoor Watch - Ultra Thin, Barometer, Thermometer, Altimeter, Weather Forecast, Storm Alarm, Stop Watch, Backlit Display to your Shopping Cart. 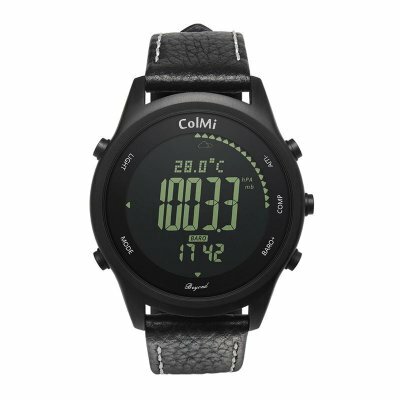 With a thickness of merely 7mm, this gizmo is one of our thinnest outdoor watches. The watch itself features a stylish and sleek design which can be worn by both men and women. It comes with a premium looking round glass dial and leather strap. The watch is furthermore life waterproof so you won’t have to worry about it accidentally getting wet. Although it might look like any other watch, this wrist piece is so much more. It comes packed with an abundance of outdoor features that lets you take the most out of your upcoming trips and outdoor adventures. This outdoor watch is powered by a CR2032 battery that brings along 180 days of standby time. It furthermore comes with a backlit display which allows you to use it at both day and night. With its barometer, this sports watch keeps track of the air pressure in your surroundings. It will also keep you up to date about the current temperature, your altitude, and the weather forecast. This outdoor watch even comes with a storm alarm to make sure you’ll never get stuck in bad weather again. Additionally, it comes with all basic time and date functions as well as a stopwatch, countdown feature, and alarm clock. This outdoor watch comes with a 12 months warranty, brought to you by the leader in electronic devices as well as wholesale electronic gadgets..